Weird Star Wars-themed Halloween costume, brave starship mechanic, and loyal messenger: R2 freakin' D2 is coming to a sky near you. Like right now -- not in the 33rd century. Japanese airline All Nippon Airways has unveiled a new R2-D2 jet that looks JUST like everyone’s favorite voiceless droid. Why, you ask? Because Star Wars is way better than Star Trek, that’s why. 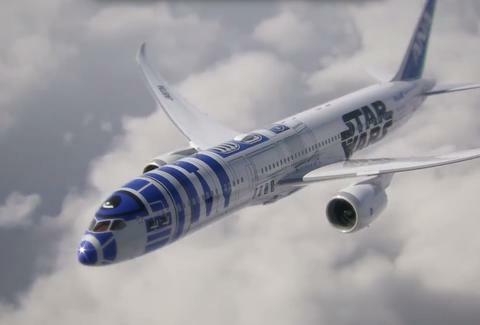 Also, because All Nippon Airways just launched its five year “Star Wars Project,” which will connect Japan with the global market. There aren't many details on the project itself, but if it means funny paint jobs on jets, it sounds terrific. The 787-9 Dreamliner R2-D2 jet's set to fly international routes starting this autumn. Though ANA hasn't disclosed which international routes these will be, or if they'll ever make a C-3PO jet with an annoying, English-accented intercom. Or a fur-covered Chewbacca jet. That'd be gross. But the airline does fly nine routes out of North America, and its hub is in Los Angeles. So R2-D2 might be coming your way soon. ANA certainly timed the announcement perfectly, as the Internet is in hysterics over the new Force Awakens teaser. Even if the movie's a total letdown, at least one airplane won't be. Because of lift. Get it? It's going up. OK, bad joke. But cool plane. Check out the video below. Kara King is a Thrillist intern and SoCal native. She is still trying to make sense of this strange, worldwide phenomenon called “weather.” Follow her attempts to live without all that sunshine at @karatillie.